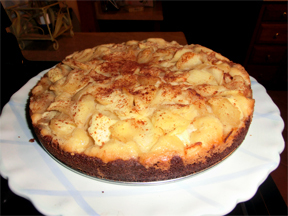 Anne Burrell from the Food Network show Secrets of a Restaurant Chef made an Apple Brown Butter Tart and I wanted it. Wanted it bad, so bad I had to find a way to make it gluten free. I made it and it was so good I wanted to share what I did. For the filling: In a small saucepan, melt the butter and cook it until it starts to brown and begins to smell like hazelnuts. Transfer the butter to the bowl of a stand mixer equipped with a paddle. Add the sugar and beat together on medium speed. Gradually add the flour. Once the flour has combined, add the eggs one at a time. Beat in the vanilla bean seeds. OR ADD VANILLA FLAVORING. For the apples: In a large saute pan, melt the butter over medium heat. Add the apples and sugar and cook until the apples start to soften, 6 to7 minutes. 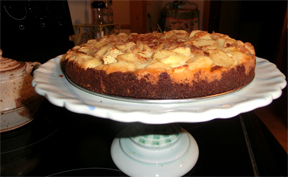 Pull the pan off the burner and dump the apples into the tart crust. Bake the tart in the 350 degree oven until the top is golden brown and slightly crispy, 45 to 50 minutes. Anne Burrell's Note: This filling is enough for 2 tarts. It's easier to make a larger quantity and it lasts in the fridge for a few days. * I didn't know what to do with the extra filling and because it tasted go good I knew I'd eat it if I put it in the fridge. Next time I'll pour it into a small loaf pan for a mini cake. *I watched the show again and Anne Burrell says the extra filling can be frozen. How to Cook like a Rock Star. That looks delicious - even to someone who doesn't need to eat GF! !